LOCKPORT, NEW YORK (August 9, 2015) — This was the last day in the field for Andrej Ernst and me. We met all our goals (collecting bryozoans from the Rochester Shale, finding sclerobionts anywhere, and learning more about New York fossil localities) and had a great time. Now we have two days left to pack our specimens, ship those going to Germany, and review our notes. We will probably get some time tomorrow to see Niagara Falls! We worked this morning in Caleb’s Quarry, a place we visited on our first day. Paul Chinnici, one of the fossil enthusiasts working this quarry, was our generous host. We were impressed with how much has changed in just the five days since our last time here. The large excavation above, for example, is new. This is fossil-collecting at a very large scale! Andrej searched for more bryozoans in the top layers of the shales while I studied these blocks of resistant calcareous siltstones and limestones. They are from a layer about midway down in the quarry. 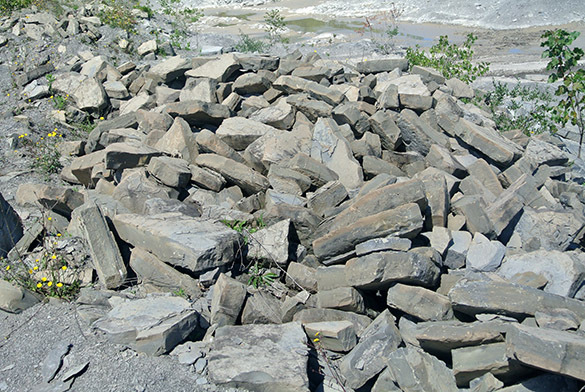 The shales erode to clay around them while they stand in relief. The blocks have excellent trace fossils, including Chondrites seen in this bedding-plane view on the top of a block. 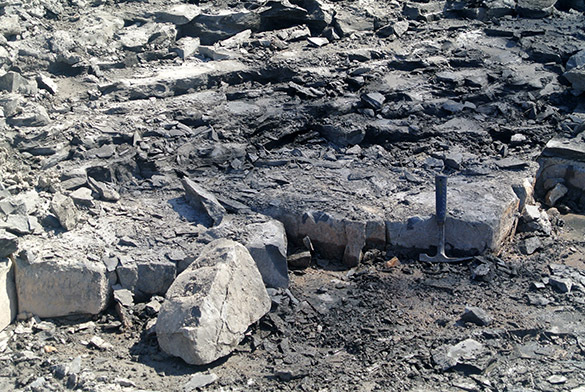 Chondrites was made by small animals mining the sediments for deposited organic material. 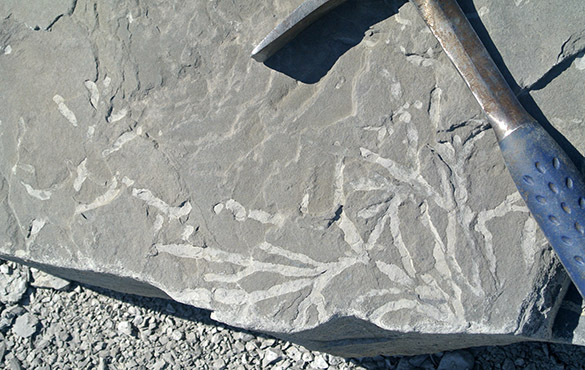 The trace fossils cut down into the siltstone, seen here in side view. 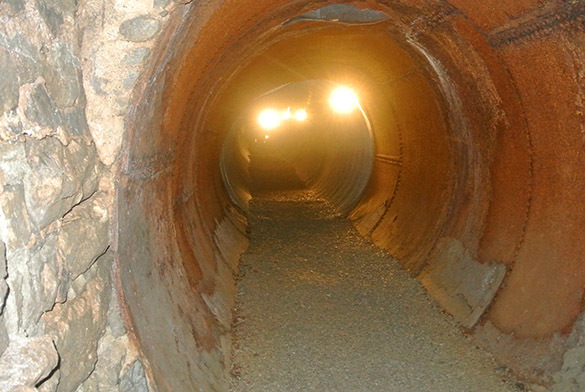 The tunnels are filled with a clay-rich sediment that weathers a lighter color, giving us this contrast. 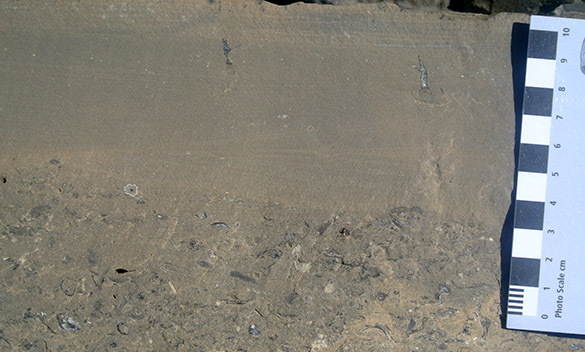 Many of the blocks show a turbidite-like structure, with coarse shelly debris at the base and cross-bedded siltstone above. 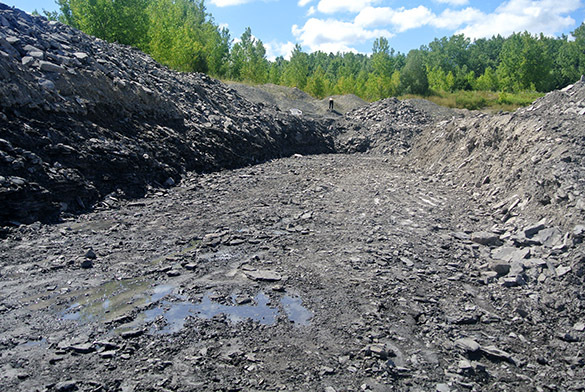 This may mean that the deep-waters that accumulated the clays to make the gray Rochester Shale were occasionally disturbed by massive turbidity flows of a sediment-water slurry. Were these triggered by storms or seismic events connected to orogenies to the east? Because of the recent excavations at Caleb’s Quarry, we were able to see this persistent calcareous siltstone in its stratigraphic context. It is here marked by the hammer. Note the gray shales above and below. With this last observation, our fieldwork is officially done! During the afternoon we again visited the Erie Canal locks in Lockport. 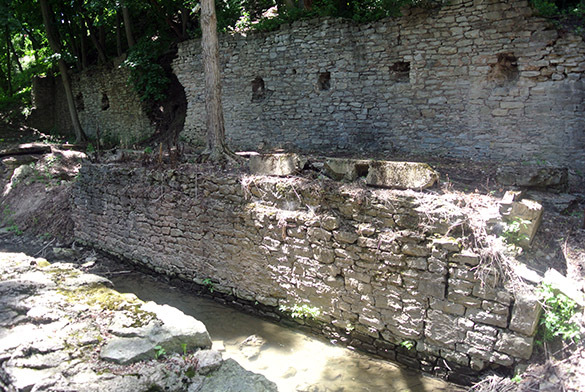 This time we took a tour of “Lockport Cave”, which is really a set of tunnels dug in the mid-19th century to channel river water through “races” to power factories. It is quite an ingenious use of hydropower before electricity. Above are the remains of the last of these water-powered factories, a paper pulp mill. We entered the main tunnel through a massive pipe that used to bring fast-flowing water to water wheels in the paper factory. 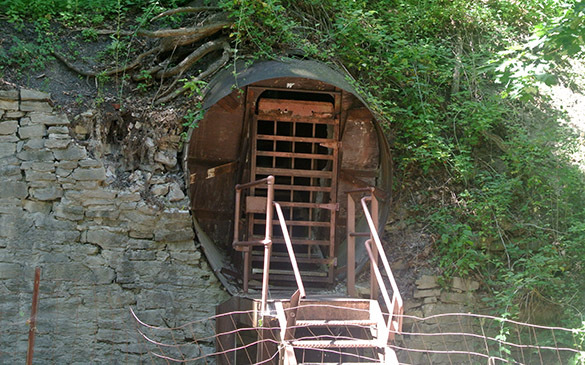 The pipe is eight feet in diameter, and the water flowed at about 12 miles per hour. This is the only one of my interior photos to succeed. The place was fascinating, even if it was cool, damp and dark. The trip included a short underground boat ride along a narrow water channel. 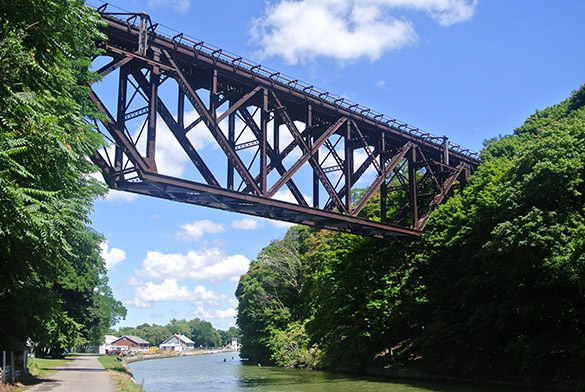 Finally, just because it is cool, here is the Lockport Railroad Bridge over the Erie Canal. It is called “the upside-down bridge” because the trusses are underneath the tracks. The legend is that the railroad company built the bridge this way to limit the height of boats on the canal, thus limiting its competition for cargo transport!